The Weed arch spans Main Street just east of U.S. 97 & Business Loop I-5 (Weed Boulevard) into Downtown. Photo taken 08/02/11. Business Loop I-5 intertwines with Interstate 5 northward from Exit 745 with Vista Drive to Exit 748. The 2.9 mile long route coincides with U.S. 97 (South Weed Boulevard) from Exit 747 near the College of the Siskiyous northward into Weed. California 265 (North Weed Boulevard) runs along the 0.50 mile stretch leading west from Downtown Weed to I-5. The Weed business loop begins at the diamond interchange (Exit 745) connecting I-5 with Vista Drive and South Weed Boulevard. Vista Drive serves an array of traveler services along the east side of Interstate 5, while Weed Boulevard (Historic U.S. 99) carries the business route northward to the west. Photo taken 08/02/11. Business Loop I-5 accompanies Vista Drive west from the northbound off-ramp (Exit 745) to South Weed Boulevard. The return ramp for I-5 south to Redding departs next. Photo taken 08/02/11. The first Business Loop I-5 shield assembly appears at the point where traffic transitions from Vista Drive west to northbound South Weed Boulevard. Photos taken 08/02/11. South Weed Boulevard stems north from Vista Drive west and Mountain View Drive along former U.S. 99. Photo taken 08/02/11. Heading north along Weed Boulevard by the College of the Siskiyous, Business Loop I-5 approaches a modified diamond interchange with Interstate 5 at College Avenue west. The exchange also represents the south end of U.S. 97, which is unmarked here. Photo taken 03/31/05. The previous sign assembly along Weed Boulevard north at College Avenue and I-5 south included a Business Loop I-5 shield and the simplified choice: College or Weed? Photo taken February 1999. The ensuing Business Loop I-5 shield assembly after I-5 (Exit 747) omits U.S. 97, even though the two routes overlap northward to Downtown Weed. Photo taken 03/31/05. A welcome sign for Weed follows along U.S. 97 & Business Loop I-5 (Weed Boulevard) north. 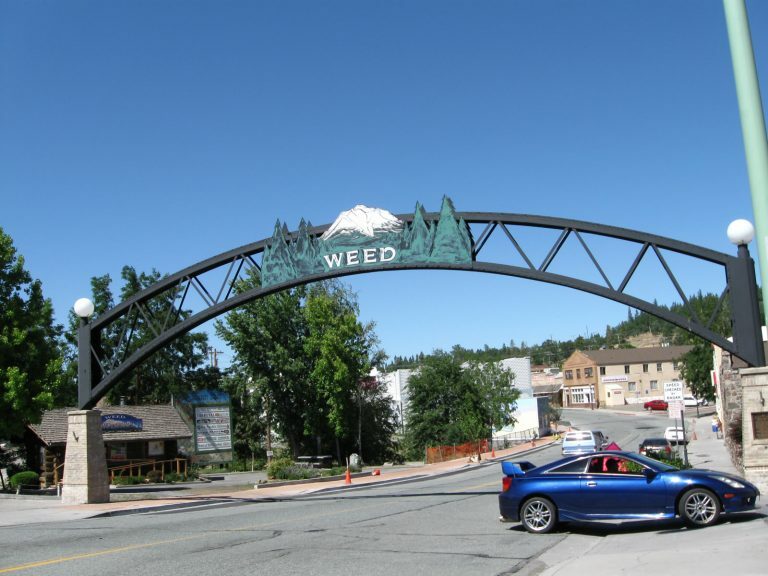 Home to 2,967 people as of the 2010 Census, Weed was incorporated as a general law city on January 25, 1961. Weed consists of 4.8 square miles of area and sits at an elevation of 3,467 feet. Photo taken 08/02/11. Weed Boulevard leads north along a business strip providing most motorists services after Boles Street. Photo taken 03/31/05. A Historic U.S. 99 trailblazer stands along Weed Boulevard north after Boles Street. For those heading north along U.S. 97, now is the time to get food or gas, as options northeast to the Oregon state line are in short supply. Photo taken 08/02/11. Main Street angles northeast from Business Loop I-5 & U.S. 97 (Weed Boulevard) into Downtown Weed. Main Street and Alamo Avenue represent the 1940s alignment of U.S. 97 through the city. Photo taken 08/02/11. U.S. 97 north and Business Loop I-5 & Historic U.S. 99 part ways at the succeeding northbound signal for Weed Boulevard west. This intersection was realigned so that U.S. 97 is the through roadway. Photo taken 08/02/11. Historical look at wye intersection where U.S. 97 split from Business Loop I-5 north toward Klamath Falls and Bend, Oregon. California 265 overlays the rest of the business route back to I-5 at Exit 748. Photo taken February 1999. Leaving Downtown Weed, this sign assembly directed motorists from South Weed Boulevard (Business Loop I-5 and U.S. 97) to Interstate 5 north at Exit 747. It was replaced with a new guide sign and a stand alone shield for the business route by 2012. Photo taken 03/31/05. Southbound Business Loop I-5 (Weed Boulevard) passes under Interstate 5 ahead of the on-ramp to Redding and Sacramento. Although U.S. 97 is not marked along South Weed Boulevard, it legislatively ends at I-5. This button copy guide sign was removed by 2012. Photo taken 03/31/05. Weed Boulevard continues beyond I-5 and the south end of Business Loop I-5 and U.S. 97 to Vista Drive. College Street extends west to the College of the Siskiyous. Photo taken 03/31/05. Business Loop I-5 curves from South Weed Boulevard onto eastbound Vista Drive for the final distance to Interstate 5. Photo taken 08/02/11. Entering the diamond interchange with Interstate 5 along Vista Drive. I-5 leads south to Redding and Sacramento and north back through Weed en route to Grants Pass, Oregon. Photo taken 08/02/11. Gas and food are available on the east side of the Vista Drive interchange. Portland, Oregon lies 350 miles to the north along Interstate 5. Photo taken 08/02/11. February 1999 by Jim Maffrand.